One of the things I love to do is to answer your questions in an honest and practical way. So every now and then, I dedicate a podcast to sharing my answers to some of the questions that you have asked. Now — don’t be shocked when you hear me talking fast on this episode. I try really hard to get as many questions in as I can without making the show too long. You have been warned! In all seriousness, I see your questions. You send them to me via email, social media, or in person when you meet me at a speaking event and it’s my desire to help in any way that I can. Here’s what you need to know, if you have the question, someone else probably does too. I share this Q&A because it helps us all to know that we are not the only one facing the situations that we are in and while sometimes the answers aren’t perfect or pretty, there is hope. 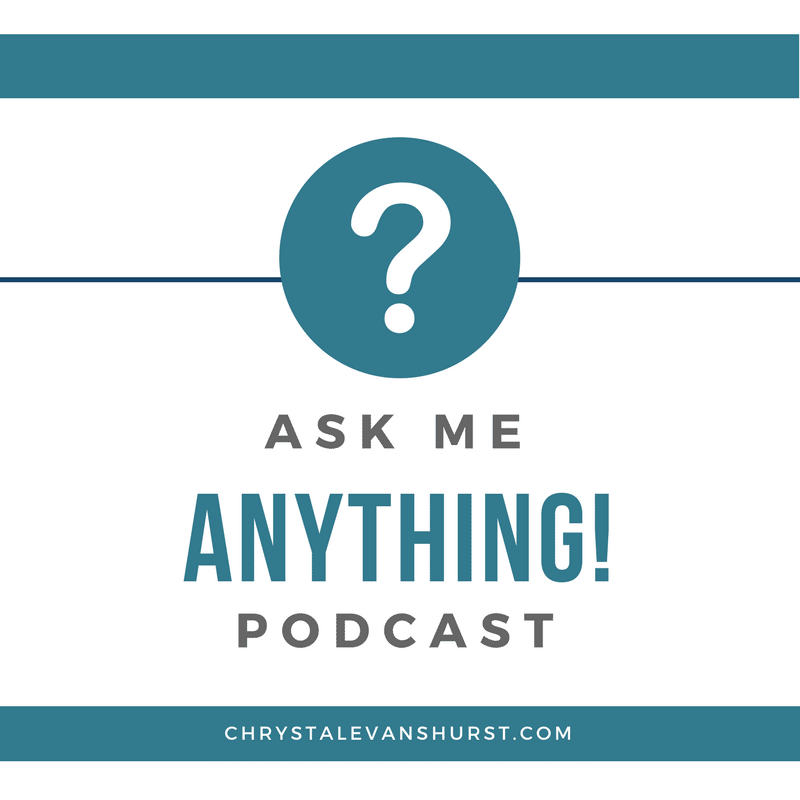 If you have question, you can always leave me a message or send me a voicemail by visiting chrystalevanshurst.com/askme. I look forward to hearing from you! How can I survive a loveless marriage? Why do you homeschool and what curriculum are you using to teach your kids? What do you do to set healthy boundaries with overbearing family or friends? Should I stay at my church if I’m not being fed spiritually? How do you handle a husband who does not use encouraging and uplifting words in interactions with his wife? How did you get started writing your book and finding a publisher? I’m a mom of small kids. What can I do to get out of the rut that I’m in? If you could have a conversation with your thirty year old self, what wisdom would you share? How do you continually find the motivation to work out? What are some of the holiday traditions you enjoy in your family. 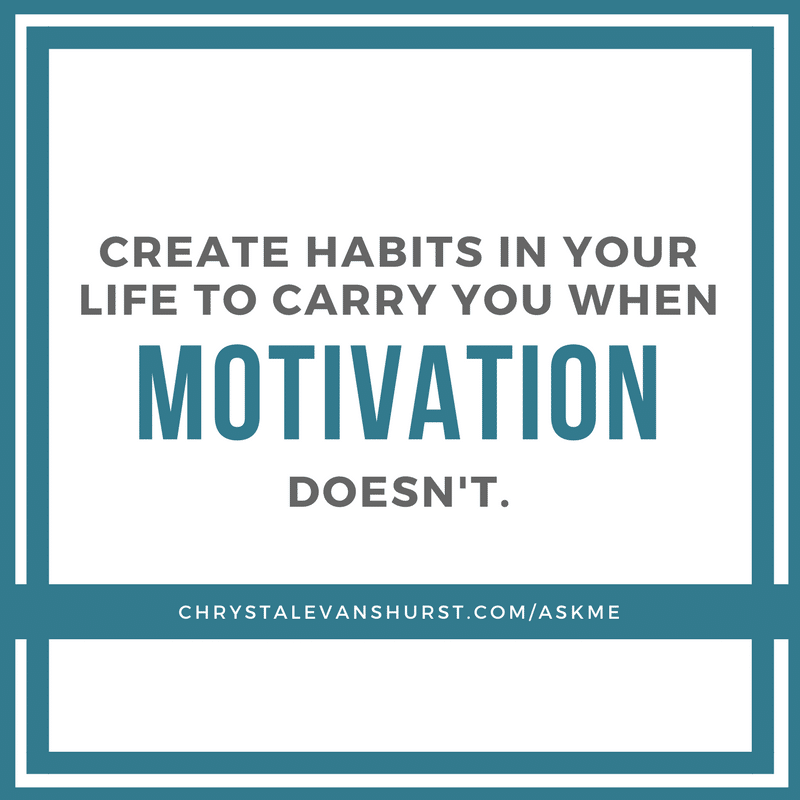 Create habits in your life to carry you when motivation doesn’t. You have to constantly rehearse your value and not depend on others to tell you what they think about you. Difficult years won’t last forever. Children learn character by watching your example. Did you miss Part 3 of How to be Happy You’re Not. Check it out here! Which question and answer was the most helpful to you today? What advice would you share in response to the questions from today? What wisdom do you have to share? In preparation for new podcast episodes in the new year, what topics would be helpful to you for me to delve into? Thank you Chrystal for you transparency, I really appreciate how you take the time to minister to the needs of the body of Christ. Just wanted you to know that I’m thankful to you and I’m enjoying your book. I’m thankful for you taking the time to listen? What a blessing! I found many of the questions and definitely each answer tremendously helpful. Sometimes you may not be going through something but someone in your circle may so it is good to hear a Godly perspective on different situations. Thanks for taking the time to share so openly and honestly. My time to fold and put away laundry went by remarkably fast today while listening to your Podcast! What a wonderful Monday treat for me after such a full Thanksgiving holiday. You are such a blessing. Praying for your kingdom work. Glad I could help you get some work done!